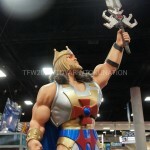 Matty Collector has released new images of Masters Of The Universe Classics Octavia today. In these new images we get to see Octavia’s new Classics bio! The unpredictable waters of the Etherian seas are home to many seas creatures, none more dangerous and cunning than the Aquatican warrior Octavia. Working her way up the Horde ranks, she eventually became a Horde commander, first in her home waters of Octopus Cave and eventually serving Hordak in the Sea of Sigh and the Fright Zone. Truly enjoying a good fight, she cackles shrilly while brandishing weapons in her four thrashing tentacles. Octavia uses her tentacles to hold weapons and capture her enemies, squeezing their bodies into submission. 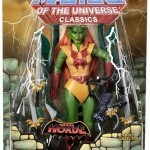 Check out all the new Masters Of The Universe Classics Octavia images after the jump. There’s more info after the jump. Read on to check it out.